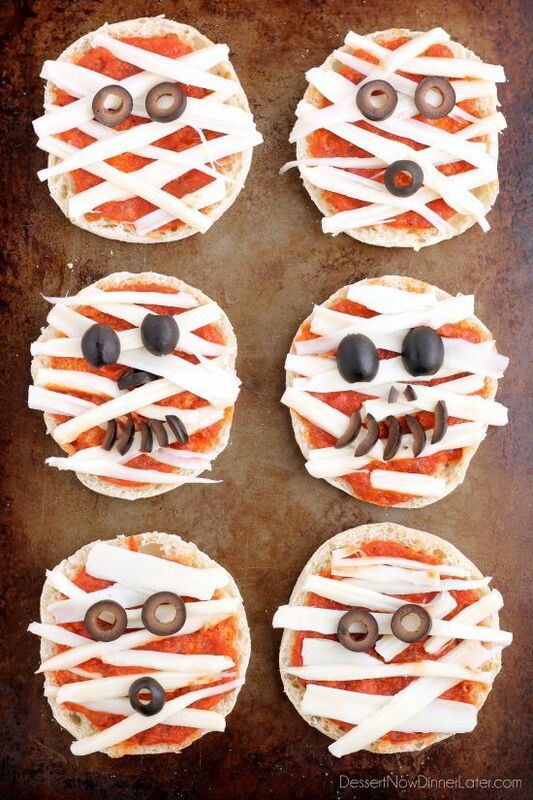 Mini Mummy Pizzas - Dessert Now, Dinner Later! 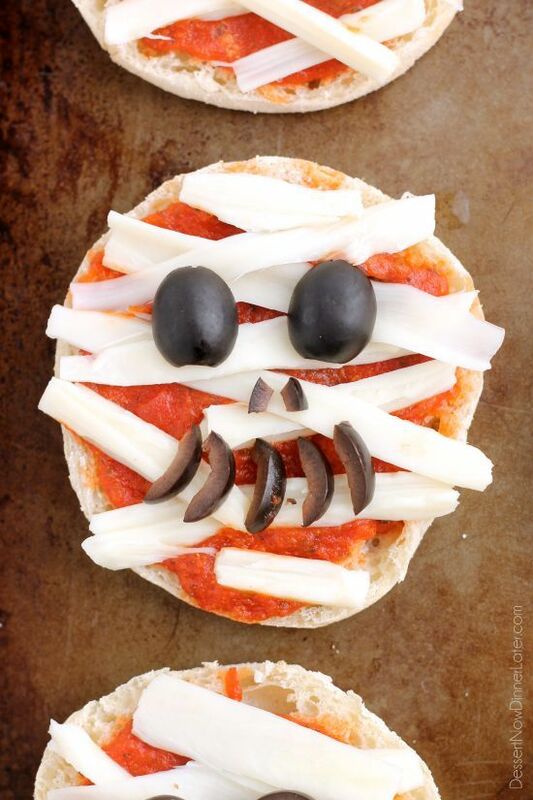 Mini Mummy Pizzas are a fun and easy food the kids can make for Halloween! 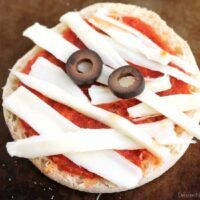 It’s that time of year again, when I get to have fun with my blog friends by sharing super cute Halloween ideas that you can make with your families! 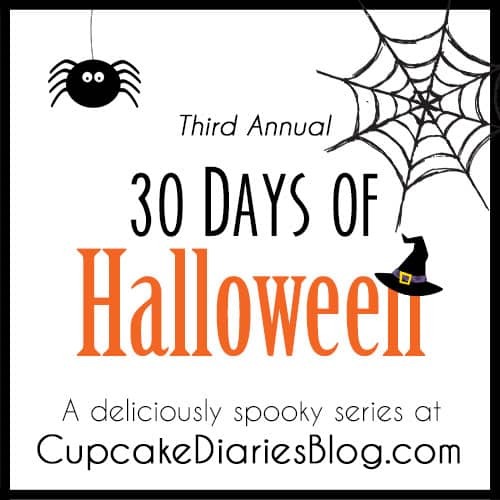 It’s the 3rd Annual 30 Days of Halloween Series hosted by Cupcake Diaries and I’ve participated every year since it started! I love it! Hopefully you can get inspired with the cute ideas everyone has shared so far! For this year’s contribution, I decided to share something the whole family can make, right down to the little toddlers. 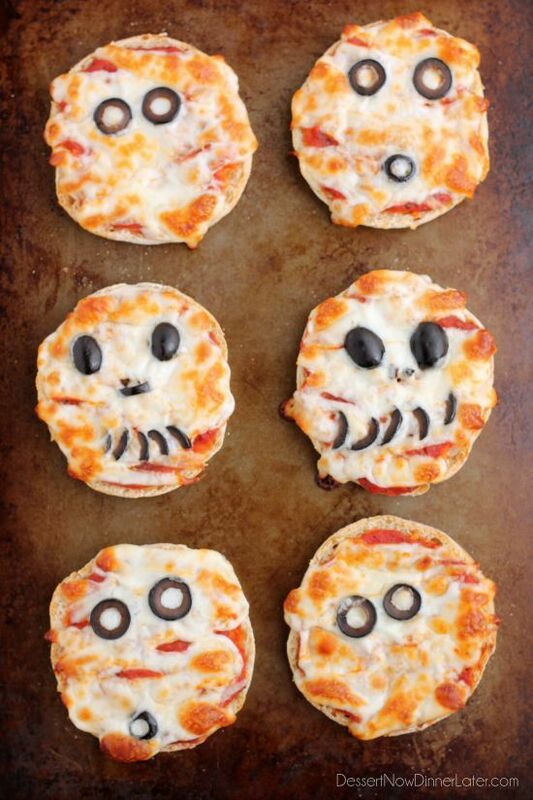 These Mini Mummy Pizzas are a great family bonding activity. Everyone can make their own and show off their creativity. 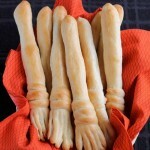 They are fast, easy, and perfect for dinner on Halloween! 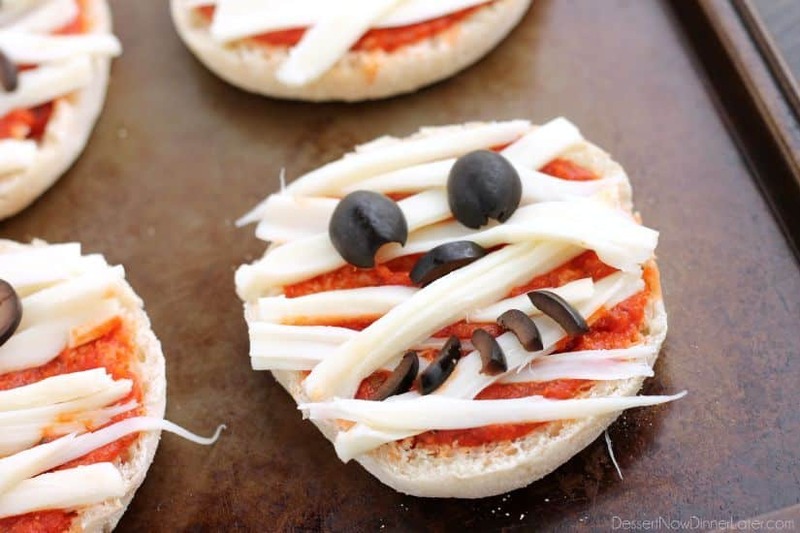 All you need are English muffins, pizza sauce, string cheese, and black olives. Cut the English muffins in half and put them on a baking sheet. 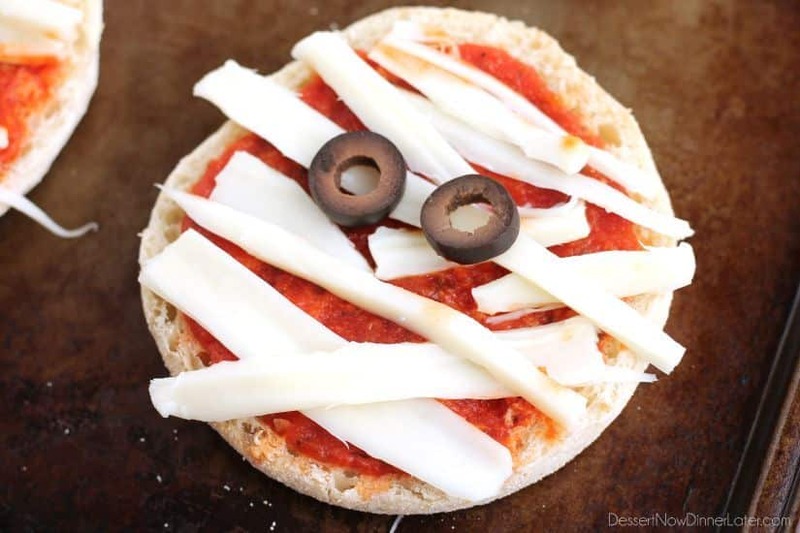 Spread pizza sauce on each half, then criss-cross each one with some string cheese pieces, and decorate them with black olives. 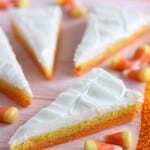 Then bake them in the oven. Voila! Easy peasy! 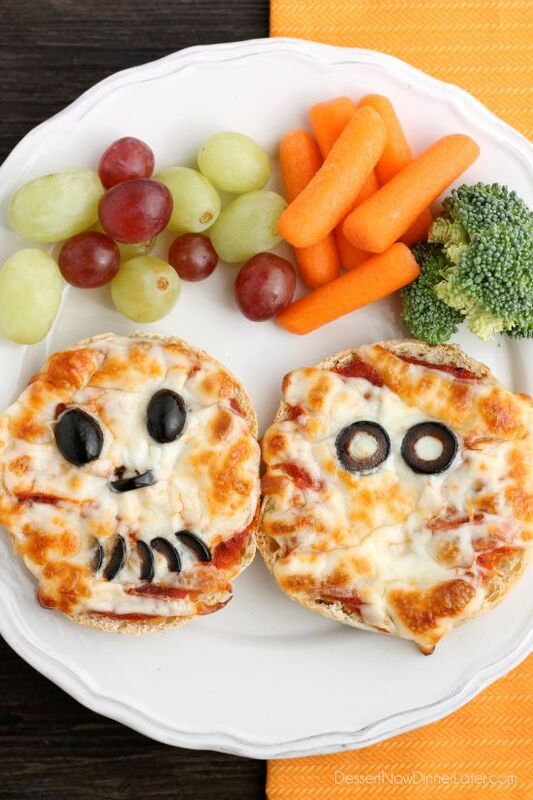 I like our muffin pizzas crisp and the cheese bubbly, but if you want to cook these just long enough for the cheese to melt, so you can still distinguish each mummy’s wrapping, that is fine too. Just don’t cook them as long. Cut each English muffin in half. Place on a baking sheet. 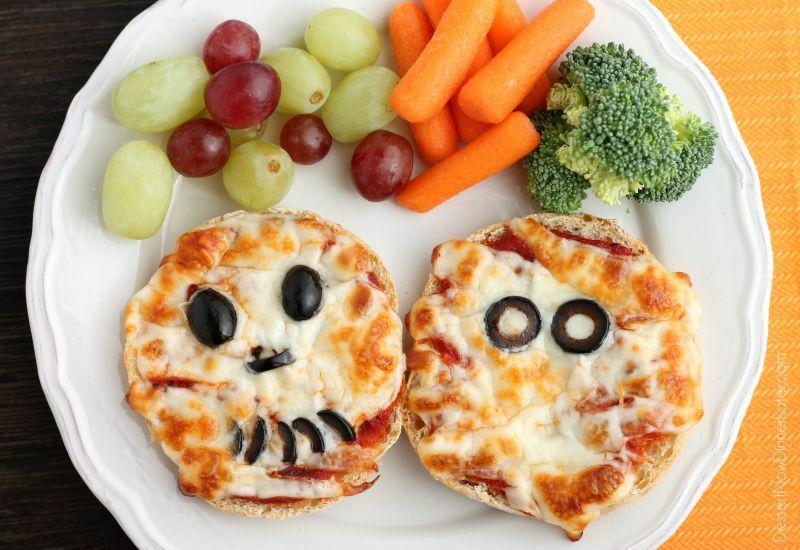 Spread pizza sauce on each muffin half. 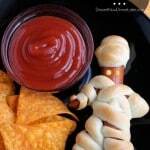 Pull apart string cheese and criss-cross the pieces to create a wrapped mummy look. 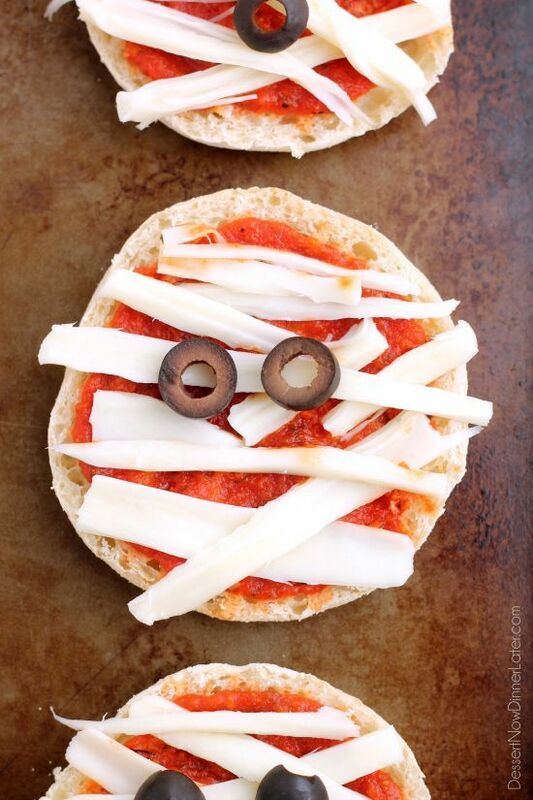 Cut olives for eyes, noses, and mouths as desired. Bake at 425 degrees Fahrenheit for 12 minutes, for a crisp crust and bubbly cheese. Bake for less time to keep the cheese white. Thanks Kelly! I hope you have fun making them! These are adorable, Amber! It would be so fun for the kids to help. I’ll have to save this one for my nephews! Thanks Jen! 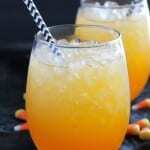 They are so fun for the kids to make! Festive food is some of my favorite! Thanks Jess!